Guardian: “Ending climate change requires the end of capitalism” | Watts Up With That? Capitalism has to go – but apparently we shouldn’t listen to unhinged claims from the “pro free market” wing that the climate action movement was always just a Communist Trojan Horse. Interesting that the author jumps straight to demanding the end of Capitalism, without considering alternative CO2 emission reduction strategies like embracing nuclear power. End capitalism and replace it with what, socialism, communism? How has socialism and communism worked so far in regards to protecting the environment? So far history shows socialist and communist systems don’t work and are terrible for people and the environment. They blew up the reefs in the South China Sea and turned them into massive military bases? That was a good thing wasn’t it? No one from the loony-left even complained in any way about it. They were too busy falsely-accusing the innocent, and getting out their feeding spoon to dig into the half-billion dollar Govt handout to ‘save’ the perfectly OK GBR instead. Gotta get you’re priorities right – free money comes first! yeah greenpeas managed to go blind and deaf on all that habitat and eco desruction didnt they? The Green New Deal (GND), a term presently most associated with 29-year-old US representative Alexandria Ocasio-Cortez, has provoked a wildly unhinged backlash from the “pro free market” wing, who argue that it’s a Trojan horse, nothing more than an attempt to piggyback Marxism onto the back of climate legislation. The criticism is Spot On. A quick spankbot would solve that problem. Apparently more than half the people want more free stuff, and they want the evil rich to pay for it. Full-blown Communism usually follows Socialism. They’re not trying to hide their true objective as much anymore. Most still describe it as “a radical change in economic policy”, or Marxism if you’ve seen the flags they’ve been flapping even so far back as Jokenhagen. I remember telling my brother-in-law in 2012 “just wait ’til they resurrect Stalin”. He laughed in disbelief. I hope that never comes true. Once the socialism gets near 100% you either end up with Communism or a dictatorship. The closest that you can get is ~ 67% and still have an economy that works. China is the example here. 1 BIG problem though” They went 100% and then inched their way back to 67% and they still have a 1 party system which is actually called Communism-Light. India had tried inching up but in the 1980’s they woke up and moved towards capitalism. However present govt is inching back up the socialist ladder. Sweden kept inching and reached 70% until now they have cut back to around 52%. Other countries weren’t able to stop the inching and Zimbabwe and Venezuela come to mind. The problem with inching is that people get used to the free stuff until the economy eventually chokes. There 2 ways to do this. Nationalize or tax. Tax is the safest way and you can always quickly untax. However if you inch up by nationalizing it is very hard and expensive to inch back down. China was able to do it because of a 1 party system but there were lots of disruptions. In any case socialists will never give you a number of how much to nationalize because to give you a number less than 100% would be admitting that they are ok with the remaining capitalists exploiting those workers. Sweden works with high taxation rates on consumers but low taxation rates on companies. You need only look at the UK. Following WW2 almost everything big was nationalised, coal mining, shipyards, steel, electricity, gas, car manufacturing etc. and it was bleeding the country dry. Productivity was appalling and the unions were all powerful. Then in late 60’s the odd Japanese car started to appear which were cheap and cheerful. The Koreans were building ships at a fraction of the cost of Clydeside and the UK was riven with strikes. Politicians, especially the socialist labour party, just didn’t care, or have the guts enough to do anything about it. Then Margaret Thatcher hove into view in the 70’s and during ~18 years of a Conservative government, she transformed the country. She sold off British gas and British Telecom and included the little man by allowing people to buy shares. She faced up to the unions and eventually broke them with a combination of legislation and confrontation. She recognised that to compete against the Far East manufacturers would have to pay Oriental wages and workers were well beyond that so she deregulated the banking system and allowed them to create the wealth to fund industry and commerce across the globe. She was the most hated woman in Europe because she broke the back of socialism in the UK and the country flourished. She made some balls-ups though. She tried to introduce the Poll Tax which caused rioting in the streets and eventually did for her, but without Thatcher I suspect we would now not be able to fight for Brexit. We would be a vassal, socialist state of the EU. But now there is, yet again, a drive for socialism. Tony Blair did Conservatism light and he was hated by both sides but managed a multi election tenure as PM, but he left a lot of political and financial rubble in his wake that, yet again, no PM since has had the balls to address decisively. The next big threat is Jermy Corbyn, the popular Labour leader who was swept onto the lead of the party thanks to his ‘radical’ socialist views. Their call to arms is to renationalise things they deem public utilities, Gas, Electricity, Water, Railways etc. He and his oppo, the shadow Chancellor, McDonnell are signed up Marxist. Corbyn enjoyed the company of the IRA in the past, McDonnell is on camera giving full blown communist speeches and the entire party supports the cause of the Palestinians to the extent that there have been resignations over anti Semitism. It is killing the labour party right at the point they should have a decisive foothold with the British public as the Conservative are bungling Brexit so badly there may well be riots in the streets once again. I guess every cloud has a silver lining. Thatcher did the hard graft, Blair saddled the country with debt through crony Capitalism and successive Conservative governments have proven weak and spineless. Our media, like the rest of the world, is entirely left wing, even the jewel in the crown, the publicly financed BBC which has a sworn duty to be impartial, but is the worst of the lot. I have been corresponding with an English industrial journalist who moved to Russia in 1991 shortly after the wall came down. He tells me the desire for, and belief in Capitalism, and the ethic of hard word and self reliance is better there than anywhere else he’s been in the west. Income tax is 13% whilst there is a free health service. He lives in a multi cultural, multi ethnic, multi religious, modern city of a million people, there hasn’t been a religiously motivated crime there for 400 years. Crime on the streets is almost unheard of, I suspect the Russian approach to punishment may have something to do with that. The city has 2 (?) universities, it’s a centre for gas and oil production, it’s also high tech with the equivalent of a Rolls Royce aerospace engine production business and the place has it’s own international airport. He lives in a 3 bedroom luxury apartment in the city which cost him £70,000, the equivalent in London would start at £500,000+ and go up to millions. He tells me that on his frequent trips to Europe and the UK, he doesn’t recognise the country we describe as Russia. Whilst the west, and particularly the left (how ironic), wrings it’s hands over Russian spying and interference in elections, he points out the whole of the western world has been spying on the USSR and Russia for nearly 100 years and the borders of Europe and Russia have various ‘allied’ military bases on or near them whilst Russia has none anywhere near an American border. It just seems to me the world is somehow turning on its head, much of it driven by the loony, westernised, ideological left that’s blind to reality. Worst of all is the immediate global threat of Brexit. It should have remained a parochial affair with the UK quietly cutting ties with the EU, but it’s now put Democracy on trial in the very place where Parliamentary Democracy was perfected. A short a summary as I can manage is this: If the Democratic decision of the British people to leave the EU is not honoured (and there is a distinct possibility it might not) the implications will reverberate round the world with socialism celebrating the death of Capitalism, as Marx predicted. The world is watching, and no one is immune. A couple of points if I may HotScot. Brexit is the battle for Nation State Democracy against Socialist Globalism. Thanks, Hot Scot (and rapscallion). As a Yank I found that most informative. What all happened was not very well covered in my world history courses, and much of it happened after I was working for the university rather than attending. Believe it or not, it was the British Car industry, Austin IIRC, that assisted the Japanese in building up their car making industry with tooling, engineering expert knowledge and training. The Japanese workforce were unionised too however, rather than the “workers” combating “management” and not a lot getting done badly, as per the British model, the Japanese worked together to build better cars and build a working environment that was better for all sides. It’s why the Japanese are so good at making stuff, anything. I saw this first-hand at Honda in Swindon in the UK. The whole world has the Koreans taking over in making cars, trains, aircraft and ships etc now. Thatcher is also blamed (by the BBC, Guardian and usual suspects) for ‘destroying’ the British miners. But in reality, deep mining was ‘destroyed’ (good riddance to dangerous and filthy working conditions) because transport systems became so efficient that it was cheaper to import surface-mined coal from the US and Australia than deep-mine it in Europe. Those who wish to blame Thatcher have to account for the fact that all the deep mines in France, Belgium, Germany etc closed at much the same time. I understand there are still deep mines on the Czech/Polish border for anyone desperate to undertake this type of work (at local pay rates, of course). Entirely agree. Unions and governments in the UK utterly refuse to work together despite the lessons the Japanese teach us. I’m an enthusiastic supporter of unions, but only if they abandon the combative approach. Other countries weren’t able to stop the inching and Zimbabwe and Venezuela come to mind. I fear the US is in this category as the marxism is so infiltrated into all the cultural infrastructure — media/entertainment, education/academics, judicial system, political system, government industries — on and on. Only some of the men/women (mostly older) on the street are left to resist. It’s called in the US the “ratchet effect” — can be slowed down temporarily w/great effort, but can’t go back. Stop trying to knit-pick Patrick. Why do we need an alternative? We could just end capitalism and “see what happens”. I’m sure it would all work out. I hope Occasional-Cortex does not read this , she was trying to hard to be truly radical. Simple answers for simple minds. Don’t confuse them with the details. Na, lets just go straight to Dictator. Oh, that would be such an hilarious poll question. Strong firm leadership is needed to fight climate change, before the wold ends in 12 years. Would you support Donald Trump as Emperor for Life ? 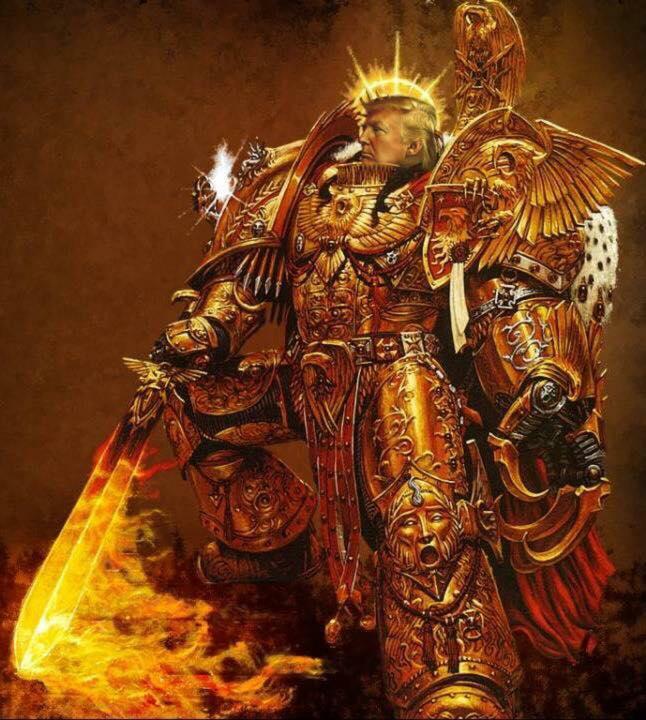 That’s ‘God Emperor Trump’, Citizen! Caliphate most of Europe in 30 years or less. It’s already began, hasn’t it? Muslim immigrants have been migrating into Europe since the EU declared “open borders”. Another 10 or 15 years and they can begin “controlling” election outcomes. That started long ago. I witnessed areas in Brussels in the 80’s that were no-go areas if you weren’t the right kind of migrant. I think Kipling nailed it. Yes, the first Kipling I memorized. Thing is, even if you “get rid of capitalism” it will still exist at whatever scale people can still make choices at. Even if the government distributes a ration of beans and rice, people will trade because some will prefer rice to beans and vice versa. Free market capitalism is simply the name we’ve given to the natural human desire to get more of what they want in exchange for something they want less. There is this new form of capitalism, a benevolent dictatorship with a princeling elite at the helm in Beijing. They are heavily involved with the shelf companies out of Honkers. Its not socialism with Chinese characteristics, they have four economic classes and lean towards fascism. The new right wing government in Italy has decided to sign up with the Belt and Road extravaganza, enlightened self interest. Brussels treats them poorly and they don’t like it. Despotism is obviously gaining traction these days. The Great Irony of China is that, after 80 years of revolution they have almost completely gone back a slightly modernized and reformed version of the same government they’ve ad for about 2300 years now – a huge and all controlling Bureaucracy, which controls every aspect of daily life for every citizen, presided over by one all-powerful man who rules by decree, cannot be questioned, and who is in his position for Life. It hardly matters whether he is called Premier, or Party Chairman, or Emperor – the power is the same. What happens when ending capitalism doesn’t follow the formula? Its a transition, capitalism seeks out new markets, Africa and South America need uplifting. How can it possibly fail? Not socialism nor communism, but feudalism. Curiously, socialism when implemented always looks a lot like feudalism with a new coat of paint. When the Berlin Wall came down in 1989 the mess that was East Germany, the DDR, was there for all to see. The historic city of Leipzig was the most poluted place in the world, courtesy 30 years of that beneficial socialism. It costed billions to clean up and the Germans are still working at it. Socialism with its planned economy is utterly wasteful. A Polish friend of mine once asked me to help him shifting his television, this was about 1980. It was massive. Why? Because it had a steel frame fit for a tank. That was because by making the tellies the steel quotas prescribed by the government’s 5 year plans were more easily met. Most socialists and communist don’t understand “capitalism” at even its most basic level, relying on their childhood notions of fairness and focusing on how a few people appear to be undeservedly rich. In capitalism, those people with some savings put their money in banks, and the banks, with professional oversight, lend it out to others who have a financial plan to make their lives better. The government backs the banks lending of up to 10 times what the bank actually has in deposits. This is by far the easiest way for a society to support 10 times as many people as you can by just taxing away the savings of those with some cash, as per socialism, or taking away everything and sending a monthly envelope of coupons to everyone for reporting to work but producing only what they are told to, as per communism. You missed the important part: 2 free men coming to a meeting of the minds to each exchange what he has for what he wants or needs. No distant dictator telling them what terms, but going by what they agree to be a fair exchange. We have just witnessed the greatest economic revolution the world has ever seen, they have thousands of years of commercial activity behind them. Its in their DNA and they play hard ball. Every now and then the mask slips slightly and one catches a glimpse of the ugly authoritarian fascist face behind it. Here the Grauniad provides us with a photo that we can take away. Perhaps the author should take a trip to see the old Soviet oil fields of Azerbaijan or the missing Aural sea, or the bubbling lake of slag from neodymium mining or any of the hundreds of other environmental disasters wrought by the enlightened socialism of Russia and China. Just have a look at these if you want to see how little the extreme left really cares about the global environment. Compare it to the West and it’s chalk and cheese. The commies are total grubs, that’s the new green utopia in action. When has capitalism ever been anywhere near as disgraceful as that? What has China got to do with “the left” ? It is a capitalist dictatorship. It is belching out pollution to provide western consumers with junk. It is the key player in global capitalism. Don’t let the name of the ruling “Communist Party” fool you, I suppose you believe the Democratic Party are democratic too. Today the green movement is controlled and directed by its capitalist masters to make sure it is not only not a threat, but can be used to make a profit. When was China ever ‘capitalist’? Government run capitalism is nothing more than socialism. Actually, it is the ‘proper’ definition of Fascism – Govt. control of the private owned means of production where Socialism is Govt. ownership (no private property) & control of the means of production. Apparently you have let it fool you. Once again, Greg demonstrates that in his “mind” anything that isn’t pure communism, is capitalism. China is aggressively nationalistic, taking ‘lebensraum’ from its neighbors, has a racist self-image, governmental crony capitalism, state control of individuals. Everything for the state, nothing outside the state. We know know how communism evolves. It evolves into fascism. Six males for every five females, what could go wrong? R Shearer, another reason for China to engage foreign military adventures, along with the distraction from their failing managed economy. That is called the Democrat Party. Being a democrat doesn’t guarantee you are democratic. Of all imaginable dictatorships, the one with Guardianistas in charge is the most terrifying. Most concise statement of the lot. You’ve nailed it. Thethought of The Guardian’s Editorial Board running our world should terrify every human who loves both Peace and Freedom … and their own lives. One of the truest and most astute observations on the nature of tyranny, and the reason why left-wing dictatorships have always been the worst and bloodiest. I’m a lover of Clive Staples. A very wise man. Greta needs to watch “Lord of the Flies”,.. classic for her age group … And reflect..,, the future per green tribal mob rule. Loss of innocense and a harbinger of the future. Sweet Meteor of Death in 2020! Those dangerous psychopaths want to plunge humanity in misery in order to solve a non existent problem. In socialism there is no misery for those at the top. Sounds like desperation to me. Methinks that he realises that the good times of eco this and that are finally coming to a end. All we now need is for the Commission promised by President Trump toprove to the World that the Molecule CO2 is a good gas and essential for all life on Earth, and its by by to the thousands of parasites living off the taxpayers, I hope. Climate change is simply the cover story to con people into accepting that process. In one camp are those of us who are aware that the entire AGW nonsense is a ludicrous quazi-religious cult from go to whoa, and that all of the superstitious symbols of global warming, climate change, greenhouse effect, sea level rise, etc are nothing more than the figments of a childish imagination. The other camp can only be accurately described as stupid, ignorant, and gullible. It’s scary that “the other camp” may well turn out to be in the majority, through ignorance, or brainwashing, drip-fed from birth with alarmism. Those striking schoolkids will be voting soon enough. Sleepwalking into socialism? Faces locked to phones? Makes me feel somewhat anti-democratic, because I believe I’m right, and we can’t let the warmist nonsense continue. But I don’t like feeling like a crazed right-wing fringe conspiracy nut either. “An Appeal To Reason” has not, in general, been heard. These eco fascists don’t want to end capitalism, they want to end technological civilization itself. James Hansen endorsed this extreme eco fascist book by Keith Farnish. The drive to remove cattle is a real telltale of the idiocy and low resolution thinking of econuts. Cattle are high density food and as has been known for a century at least, are most if not all that you need nutrionally. A balance between agriculture and ruminants is much better. Especially ecologically. In the last few years I have gone low carb, and now I eat a lot of steak and fat. Feel much better, skin better, no effects on lifting or training. Funny thing was when I told this to my 81 year old father, who was a butcher and taught butchery. I’ve been trying to tell you that for years, he said. Always watch out for the tyranny of low resolution thinking and low density solutions. Surely the basis of all food is following the calorie trail. How many calories are converted from sunlight into food for humans. The plant based component of our diet is extremely efficient at this. The animal part of our diet is wasteful in terms of calories, but a more potent supply of proteins, fats and vits/mins. Looking at only one tiny part of that chain to determine the “density” of food is totally misleading. We evolved as omnivores, a mainly meat diet is as dangerous to human well-being as a mainly vegetarian one. Look at how the remaining “primitive lifestyle” people eat for the most appropriate diet from our evolutionary viewpoint. Farnish is obviously a psychopath. And a dangerous one at that. Get rid of capitalism? Capitalism is just striving. You going to ban striving? Marx popularised the term capitalism so he could attack it. And his alcolytes continue. And that is what is happening today with the radical Democrats. Marx couldn’t attack Freedom by name, so he renamed it Capitalism. I suggest a slight change to your astute and accurate observation: the word ‘freedom’ is not nearly as popular with the Left as the word ‘rights’. I would suggest saying that capitalism is the result of exercising one’s human rights. Or, you cannot ban capitalism without banning rights. A distinction without a difference, but it will cause the left problems. But the Soviet Union, East Germany, China, Cambodia, Cuba, Venezuela and the like, none of them were or are REAL socialism. REAL socialism will be utopia, because people like AOC and all those children will be in charge. The Rich and Powerful are rich and powerful because they have a massive economy to draw upon, and billions of people to influence. If the climate doomsayers are anywhere near to the truth, the rich would be reduced to a paltry handful of lords . They’d be living it up in their mud shacks, surrounded by peasants who live in straw ones, and their influence would extend to the edges of their village which would be constrained by how far one could walk in a day. In fact, they might not even be THAT rich and powerful. Scaling down an economy doesn’t mean the the rich are just less rich and the not rich are poor. What has values, changes. No more rich and powerful bankers, or marketing companies, or law and accounting firms that spread their tentacles across the world. Those things would no longer have value. Being able to hunt and kill with primitive tools…those are the people who would now be rich and powerful. In their village at least. A world deprived of fossil fuels would devastate the rich and powerful. Similarly, climate catastrophe would devastate the rich and powerful. As usual, the alarmists simply have no idea where either wealth or power comes from. A Communist Trojan Horse pushed into international politics by Communist Margaret Thatcher. Concern for the environment is not the unique preserve of the Left, but the millennial apocalypse cult of Global Warmery certainly is. As James Delinpole so rightly says, they’re ‘Watermelons’ – green on the outside but red on the inside. Margaret Thatcher did not advocate the end of Capitalism. “29-year-old US representative Alexandria Ocasio-Cortez, has provoked a wildly unhinged backlash from the “pro free market” wing, who argue that it’s a Trojan horse, nothing more than an attempt to piggyback Marxism onto the back of climate legislation. So wasting an estimated $100 trillion on the hilarious and unwarranted GND is “far from radical”? There hasn’t been a statistically signifant warming trend in 23 years and counting, and loony Leftist still think all life in earth will cease to exist in 12 years… Just simple math would mean that 8.33% of earth is being destroyed every year from CO2 emissions..
Leftists have lost their minds..
Nah Samurai, they will all die at once! There will be no one to see all the bodies – we will all be dead. Not much magic left in that old tipping point. Too many “tipping points” have come and gone without the tipping happening. Only those too young to have witnessed the failures of past “tipping points” (and those too stupid to have paid attention) still buy the tipping point nonsense. 12 more years and the Earth will have been utterly destroyed??? Well, if the Greenbeans and Warmunistas and CAGWers all stick together, they’ll be firs tin line to vanish like the morning dew in the sun, if they’re right. Then the rest of us can get back to whatever we were doing, right?? SAMURAI,they mainly target the young, for obvious reasons. (That’s probably also who The Grauniad article is aimed at). It’s now about 30 years since the IPCC was formed so most people older than about 40 should be able to recount that they have been regaling us with imminent death by global warming all of their lives, yet it is clear that nothing dramatic is happening. The AOC is ~29 years old so she might still get away with using age as an excuse for apparently unassailable ignorance on the subject of global warming. Unfortunately, that doesn’t excuse most of her other aberrations. According to Billy McKibben, 350ppm/v CO2 was the tipping point. Compared to what they really want, GND is downright moderate. nothing more than an attempt to piggyback Marxism onto the back of climate legislation. Let’s be fair and get the accusation correct. Its crony capitalists in bed with crony scientists, all pretending to be Marxists. I was going to say “crony” Marxists but then I remembered that there’s really been no other kind in history so the adjective would be redundant. Yep, David. You’ve summed it up succinctly. Illegitimate power doesn’t spring only from government. Unfortunately, non-governmental illegitimate power always ends up mingling and colluding with governmental power…amplifying illegitimacy. I don’t see any Constitutional way to make the super wealth “behave properly” without severe unintended consequences. I might be persuaded to accept a limit to wealth to limit illegitimate power. Concentrated power from any source can be a threat to liberty. This is like claiming we need to stop eating food. Completely ridiculous, pretending as if there is some alternative. Greenies first – you know, to show the rest of humanity they have the courage of their convictions. With the growing march of the green movement it might eventially come down to western countries dividing their borders into two and creating a capitalist half and a green socialist half, with people moving to the ideology half of their choice. This would allow for a perfect world scenario without divisions. The green socialists would then have their own infinitely printed “green” currency to attempt the dreen deal of 100% welfare existence for all, living on 100% renewable power in harmony with nature, where the electricity drops in and out depending on the wind and sun. Everyone would have gender neutral status and ensure gender fluidity was the norm and taught to their new born babies. A vegan only diet would be mandated, but all words containing “man” would be removed from their dictionary to avoid offending. Fully open borders would allow entry to the billions of people who sought refuge, with free unlimited welfare, especially the millions of IS followers in Syria and the middle east. Public housing would be available in the form of the highly celebrated tiny-houses for all. Indigenous peoples would be given a double allocation of printed money each week as would women and people of coloured skin, to make sure than any sins against their distant relatives of 10,000 years earlier were compensated. Children would be allowed to miss school every day to undertake alarmist protest for more climate action and to make sure there would be more green jobs should anyone wish to work some day in the future. The capitalist half would build a huge Trump-styled wall to protect from the violent left protesters and people would be able to live the capitalist dream. A huge Trump tower would be built so it could be seen from the other side of the wall. Sums it up pretty good. Sounds like what is happening now….. The coasts are turning crazy, the middle [and FL so far] is still sane, cept for [very large -urban] pockets here and there. We need a Trump tower in the middle tho! I do wish this site and others would stop giving oxygen to the Guardian. himself just to be the centre of attention. Hell the BBC ain’t much better these days. Anaerobic bacteria like Grauniadistas are harmed by oxygen, not helped. If you let a lie stand unchallenged it festers. They speak for a lot of people. Many in power ignored Hitler as well. More rainfalls from the Pacific are coming to California. How long did that “Permanent Drought” last? 13 months?! LMAO! Except that would also require nationalization of the energy sector and state investment. No one builds nuclear power plants in a free market. Rollback the onerous, heavy-handed overregulation, ie push for a freer market, and they will. Just put onerous taxes and regs on fossil fueled plants, and greatly relax the regs and subsidize nukes, and you will achieve your goals without officially nationalizing anything. As long as you control the money, you need not force the action in a capitalist society. Efforts will be focused on where the money is. Indeed. Do for nuclear what government has been doing for wind and solar (subsides & tax breaks to make nuclear “cheaper” than the competition) and subsidy farmers will flock to nuclear like they did wind and solar. No one builds nuclear power plants in a free market. France managed to do so many years ago. The fact is that the market as it currently stands, isn’t entirely free. The more government is involved, the less free the market is. Whenever a new plant is proposed, the NIMBY crowd come out in force to block zoning so that it can’t be build in their backyard – wasting time and resources in just getting a location to build the plant. And onerous government regulations (which cost time and money to satisfy) and frivolous eco-nut lawsuits (which cost time and money to fight) are huge barriers to building new nuclear plants as well. The costs in both time and money from all those non-market forces add up resulting in Nuclear being too expensive to build under those circumstances. Looks like even the Dutch become more stupid by the day. And Maduro supposedly won the last election with approx. 68% of the vote. Marxism isn’t just jumping on the back of the climate change scam, the scam was invented as an excuse for Marxism. Countries with the best environmental records, western and capitalists . Countries with awful environmental records, socialists ‘paradises ‘ communist states and theocracies , all if which are preferred by the left to western capitalism . So does anyone really think they give much of dam about the environment. Those who rule the communist countries, keep their areas clean. That’s all that matters to them. The solution, or should that be called “the final solution”, to save the climate is to get rid of capitalism, even though the world’s biggest emitter is communist. Gosh, I must have missed that. Having the most successful team in the history of the sport is not good enough. So fire the coach and replace him with a complete unknown. What could go wrong? Wrong, a straw man. The Trojan horse was wheeled into our children’s classrooms decades ago. If capitalism is ended, climate change will end. If all people are removed from the earth, climate change will end. The Guardian claim is fraud. Oh, so it’s also individual FREEDOM that’s the problem. We have an existential crisis and only by giving up our freedoms can we hope to survive. Got it. Well, look at the US Constitution and its Bill of Rights, guaranteeing our freedoms. How many time does the word capitalism appear? None. Capitalism results from exercising our freedoms in the marketplace. You cannot get rid of capitalism without eliminating those freedoms. Thank the heavens for your right to bear arms. We in Europe are not so lucky. Interesting how the green blob is attaching itself to the current mania for socialism among the young. Capitalism as I think of it is the creation/extraction of profit into pools of capital for deployment in the economy. This happens under communism as well as the hybrid economies where non-governmental entities play a large role. But then again I’ve lost those who don’t want low bread prices or high bread prices. They just want National Socialist bread prices. Not one of the children in these strikes and protests have seen any Global Warming. So we are to develop carbon (CO2) sequestration. As an engineer I can do that. The consequence, all plants die and these children and grand children die because they have no food. That is some objective. And the parents encourage it. “Climate change” converges towards socialism rather than towards mitigating any harm that humans are doing to the biosphere. In fact harm to the biosphere is mentioned so rarely that I cannot recall seeing a single reference to it apart from downright trendy worry-rants about this or that isolated aspect that the media fixates on. All we get from the sustainability mob are demands that are each unsustainable. The growing economic aggregation will be affordable only in the sense that government will be called upon to print and borrow the money out of thin air to pay the growing costs, which is of course a form of theft by dilution. This is a vain attempt to force the laws of economics to function by mere fiat. But the whole scheme is one big mirage. The laws of economics always prevail, no matter how fervently socialists wish otherwise. That’s just false. I won’t say this reporter is lying, he probably doesn’t know any better but what he says is not true. The truth is there is no evidence that CO2 is having any discernable effect on how the Earth’s atmosphere behaves. This is an uninformed journalist misleading the public. Every day we get this same CAGW lie repeated. Is it any wonder that many adults and children have been duped. He is promulgating a falsehood. That makes him a liar, whether he knows it or not. Marxism is not piggybacked on to the global warming scam it is and has always been the reason to create the scam. So getting rid of my property ownership somehow “fixes” the climate? Let me tell you why that is one of the stupidest ideas ever invented by man! Because if I don’t own the property, somebody or something else does!! The nebulous concept of ownership does nothing to “fix” the climate! Nothing! But that is the hidden agenda, the whole reason for their evil trickster effort in this deception: to deny the right of private ownership! Because once individuals are denied property ownership, and by extenstion anything else, the collective “state” owns it! And once that happens, folks, the state owns YOU!! What a sick, demented, counterproductive plan the Commies are hatching! Call it the Green New Deal if you live in the US, call it Agenda 30 if you work for the UN; it all comes from the Globalist effort to govern the world! They are correct. Capitalism will have to be “set aside” for them to reach their goals. The real goals aren’t climate control. CC/AGW has never been about the climate. This round of would be world rulers (in Academia, Government, Science, Law, Entertainment…the usual suspects in all of our major institutions) are bold but only make “progress” where the media speaks for them. Not in places like China. China and India are not in the CC/AGW camp…not believers. Of course our “would-be” rulers don’t really believe in AGW either, ELSE THEY WOULD NOT BE GIVING CHINA AND INDIA A TOTAL FREE PASS — there are no serious emissions limitations for them. Allowing China and India to “catch up” economically makes no sense if total CC/AGW catastrophe is certain. There’s a wee bit of hand waving…but THERE IS NO WORKABLE PLAN TO REACH EMISSIONS REDUCTION REQUIREMENTS… not even a simple country by country score sheet that shows emissions reductions that can meet CC/AGW goals. Without curbing Chinese and Indian emissions, the AGW targets cannot be met. Not even close. No problem…they aren’t really climate targets. They are political control targets. They are only working towards making a better world…with maybe 2 – 3 billion humans remaining alive in their tightly controlled sustainable utopia. Sure sounds nice to me…if I get to pick the people that are allowed to live. I don’t see how this can’t turn out good for them in the long run…they eventually have to go up against China and India and other things like the US Military…and folks like us. For now, the lefties will be happy to control just Europe and the US. They are winning in Europe…on the “front lines” of this battle. All we have going against us here in the USA are ALL of our major institutions. About all we deniers have going FOR us is the truth and the internet. Far left get elected, switch to socialist politics, western economies tumble, quality of life nosedives to levels not seen a hundred plus years. Climate continues to do what what it does and has for 4.5 billion years, CO2 levels rise, temps rise, planet gets greener, eco systems flourish. “We only have 12 years to save the planet and end this existential threat to man” shriek the commisars. I wonder if they have a 12 year plan for when the curent interglacial period comes to an end?! There is existing technology that would “fix” CO2 emissions. In fact there is ONLY one solution short of economic collapse and mass starvation (in case anyone cares). Anyone not advocating a massive Nuclear build-up cannot be serious about CC/AGW…unless they are OK with the mass starvation thing. If you are scanning the Guardian, be sure not to miss this one! Oh: also no comment on Mozambique cyclone? What off it. There’s always been these events. But now everything is attributed to global warming, unless it’s positive. Indeed, if it’s positive then Griff would say “that’s weather not climate”. It’s only climate when useful idiots like griff can point to it and claim doom and gloom due to climate change. There has been no systematic increase in cyclone/hurricane energy over the last 100 years. Up a wee bit since 1950 (maybe…some dispute), but down a wee bit when 1920-1940 is included. NOAA cherry picks dates. Mozambique was just really bad weather. Instead of wasting $100 Trillion on ineffective (because China and India aren’t included) emissions control, we could protect the people in Mozambique far better BY ALLOWING THEM TO ADVANCE ECONOMICALLY with fossil fuels. I’d prefer helping them with Nuclear infrastructure, but you lefties have made that too problematic to implement. Turns out that you lefties are the real long term threat to the world’s developing people. What about the cyclone in Mozambique? Record keeping there has been close to non-exeistant, but there is a record of one hitting that country in April of 1956, leaving 107 dead. Do you have anything suggesting that cyclones now are different from those over sixty years ago? Extreme weather events at any given time in the world are the norm. Oh it’s extreme weather now not global warming ? Griff last it was Arctic sea ice free has it gone yet like you promised? Have you been building your plastic pontoons for the poor polar bears? So what is your next prediction Griff CAGW extreme volcano activity, CAGW extreme meteorite strikes? As usual, Griff actually believes that there was no bad weather prior to a few decades ago. You are talking weather not climate. Extreme weather happens. And it happens quite often. Always has, always will. If you look at the records we have, you’ll see cyclones have hit Mozambique before. weather in the extreme category has hit both outside and within the US before. many, many times before. That such events happen (and have happened) only tells you what the weather is doing. You need to show that such events are more frequent (according to the data they are not) and/or more intense (again the data suggests not) over time in order to make a valid claim about their significance vis-à-vis the climate. I think the pertinent element is not the ‘weather’ – it’s ‘The Guardian’. My wife and her family are from the region (Zimbabwe, Malawi). While it is bad and there has been death and destruction, it has happened before, even in her lifetime, just now report come with a “See look, climate (Change)!” tone. People living in poor, badly managed countries, are more prone to being severely affected by bad weather events. The rains have been heavy, literally washing away whole villages. And Griff, yet again, shows us where he gets his information from. Keep it up Griff, you must be due for a new “klimate the klown” outfit, the one you use at the moment is just about worn out. “Capitalism” is not a “system” that can be repealed, any more than passing a law could eleminate the law of gravity. Capitalism is the explanation of the interaction between individuals and organizations exchanging goods and services. It exists under all economic paradigms, especially the most repressive. For a second opinion on today’s heat, you should review Tony Heller’s charts. Be wary of zealots seeking perfection. Beginning in the early 1900s International Socialists set out to create the “perfect man”. Then, National Socialists set out to create the “perfect” race and land space. Now, Globalists are determined that the climate of the nearest planet be set at the “perfect’ temperature. That capitalism causes “climate change” makes for a compelling banner. Just as compelling to too many as prior slogans of perfection. Well, duh. The whole point of ‘climate change’ was to justify imposing communism. The end justifies the means and all that. He says while demanding that in the name of climate action, communism be imposed. I checked out the link to the Guardian webpage that was referenced at the bottom of the “boxed” excerpt from Phil McDuff presented in the above article. In scanning the full article, I was subjected to no less than four COMMERCIAL banner advertisements presented on the Guardian’s webpage. I conclude the Guardian’s support of ending capitalism (via publishing McDuff’s pablum) is not something they themselves take seriously. Climate has always changed irrespective of styles of government. The last change is the warming trend ended. Policy tweaks won’t do it, we need to throw the kitchen sink at this with a total rethink of our relationship to ownership, work and capital. Rethink our relationship to ownership, work and capital. So now we know it is not about the climate but about power and control of ownership, work and capital. In other words communism. Unable to get their agenda through the US citizen they would go around the citizen for a dictatorial system that makes the citizen irrelevant. the “pro free market” wing, who argue that it’s a Trojan horse, nothing more than an attempt to piggyback Marxism onto the back of climate legislation. Blackouts and extreme hyperinflation are the only answer. Call for it now and make it a big theme in the Presidential election. Please oh please. So – they’re going to END climate change, now? Stagnation, entropy, extinction – about par for the progressive course. “Climate change activism is increasingly the domain of the young”. Because the rest of us have listened to the gloom and doom stories for the past 30+ years and NONE of them have actually occurred!!! There is a reason we don’t let the young drive cars. There is a reason we don’t let them drink alcohol. There is a reason we don’t let them vote, or buy firearms. They are not legally responsible for their actions, because they are not mentally mature. Climate change activism is the domain of the ignorant and the intentionally stupid. The one and only …. consistently repeated rule of who governes the humans around them is, and will be in the future …. the one who can physically defeat their enemy. It was for this reason that the US Constitution enshrined the 2nd Amendment. For it doesn’t matter who comes in and tries to to take over, doing so at the wrong end of a gun will result in failure. There is not a single “Green” anywhere who supports the 2nd. …. none, nota …. because …. The US Leftist have noted all along that the only success of Socialism/Communism is when the people are convinced to turn over their only means of defense against tyrants …. their weapons. Not surprisingly, the US contingent of Leftist are strong supporters of gun control, highlighting every school shooting or other mishap as a reason to turn over the guns …. but omitting the real reason for the 2nd Amendment …. it is to fight off dictators and tyrants who come along and try to destroy the founding principles of the US. Regarding the comment about firearms, there is a tendency, especially in the USA to point at Australia and say look at what happened there. But in fact we today probably have more firearms that before the Port Arthur matter..
weapons. The compensation for a semi auto was enough for two single shot weapons, and that is what happened. almost as fast as many autos. The difference was a bit like the bowman at Agencourt, it required years of practice to makes perfect. The single shot weapons make for more careful shooting, and greater accuracy. Look at sniper weapons, all are bolt action single shot. The USA Militha were preaty good against the British, no semi auto’s back then, I still think that bit about “The right to bear arms” meant single shot weapons. I was prior to ending up in a retirement village a gun collector and shooter, from the 1803 Enfield Flintlock to the 20th Century weapons, 50 in total. It would be helpful to all concerned if we were to define our terms. Capitalism is an economic system in which the ownership of the means of production (largely, capital and land) rests primarily in private hands, and decisions about how to invest society’s savings are largely made by the private owners. We are a long, long way from pure capitalism, especially in modern OECD economies where governments often control more than 50% of society’s resources. Nonetheless, capitalism historically has proven be by far the effective system for generating investment and income over time. Free markets are what really unleash the power of capitalism because they ensure that the choices as to what to produce and consume are largely determined through the free decisions of millions of buyers and sellers. The genius of free competitive markets is that they allocate society’s resources far more efficiently and far more in accordance with the people’s choices than governments could ever do. It is almost certainly right that the complete transformation of the world’s economy away from plentiful, reliable and low-cost fossil fuel energy to expensive unreliable sources, and from conditions of plenty to conditions of global scarcity would never be achieved if free markets were allowed to continue. It would be necessary to silence free choices, and to end the free right of people to make political decisions about how economic decisions are made, as such freedom would never permit the reckless imposition of such scarcity. There is thus a clear line of logic between saying the world must stop consuming more of the energy it freely chooses and insisting that free markets and democratic governmental systems must end. One caveat — capitalism (and capitalists) was a derisive term invented by Marx. FREE-MARKET is the correct description. It stands to reason that those countries with the worst environmental efficiency and greatest increases in CO2 are the ones we should emulate to help the environment and save the planet from CO2.